The Charlotte Teachers Institute (CTI) is an innovative partnership among CMS (Charlotte-Mecklenburg Schools), the University of North Carolina at Charlotte (UNC Charlotte), and Johnson C. Smith University, and is made possible by a joint commitment of resources and energy from all three Institute partners and through the generosity of private funders and community partners. Charlotte Teachers Institute earned the Council of Great City Schools Urban Impact Award (2013) for partnership and impact on student learning. Led by classroom teachers in Charlotte-Mecklenburg Schools (CMS) and professors at UNC Charlotte and Johnson C. Smith University, CTI is founded on four pillars of strong professional development: content knowledge, creativity, leadership and collaboration. CTI continues to maximize its strong educational and community alliances to provide engaging, effective, teacher-led, professional development for CMS educators to advance student growth. 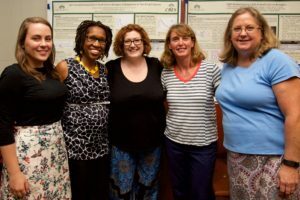 Through intensive, semester-long seminars, led by faculty from UNC Charlotte and Johnson C. Smith University, CMS teachers learn new content, work collaboratively with other district teachers, and develop curriculum units for their own classrooms. Participating teachers receive continuing education credits and a stipend. CTI, unlike many professional development programs, depends on CMS teachers to lead the Institute. Teacher Representatives develop leadership skills and influence professional growth opportunities for all CMS teachers as they select CTI seminar topics, recruit fellow teachers to participate, and help faculty members facilitate seminars. Recognizing that classroom-teachers possess first-hand knowledge regarding student content needs, CTI depends on its Teacher Representatives to select topics that will interest teachers and enhance student learning. UNC Charlotte and Johnson C. Smith University faculty members serve as Seminar Leaders and 10-13 CMS teachers (referred to as Fellows) participate in each seminar. Seminars reflect the Leaders’ fields of expertise, address the content demands of participating Fellows, and create a collegial environment dedicated to group discussion and exchange. Each seminar meets approximately once a week for two hours over the course of a semester. CTI offers eight content-rich seminars annually, with three Spring meetings, a summer reading and research period, ten Fall meetings, and periodic one-on-one conferences with Seminar Leaders. In addition, CTI presents special events for teachers and the public that highlight Johnson C. Smith University and UNC Charlotte faculty members, their areas of expertise and potential seminar topics. All interested teachers should check the Calendar of Events and Teacher Participation links of this website for more information regarding recruitment, applications and upcoming events. The first initiative of its kind in the state of North Carolina, CTI was established in 2009, based on the Teachers Institute approach begun over 35 years ago by the Yale National Initiative in New Haven, CT, and since executed in cities around the country. In 2015, responding to the needs of our district and in keeping with the Institute’s goal to be a district-wide program, CTI made the decision to serve eligible teachers at all CMS schools and became independent of The Yale League of Institutes. CTI and its partners look forward to continuing to expand the Institute in innovative and exciting ways to best serve CMS teachers.